So, the weather is getting colder. They have been predicting snow here but it hasn't happened yet. I got out and turned another bin, I'm back to bin #1. It has been about a month - I have four bins, turn one a week. Most of the food waste I put down is unrecognizable but the worms are massed in this area because of the richness of bacteria that has been working on decomposing the food waste. 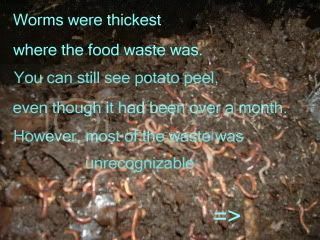 I have heard it said that the worms do not actually eat the food waste per se, but that they chow down on the bacteria that is breaking down the food waste. I don't really care as long as it all happens like it's suppose to. I continue to harvest worms as I work the beds. I put them in holding bins and continue to feed them until I get an order for them. I have a set of shelves I'm going to clear off and make more room for holding bins. It is concievable for me to ship worms all winter if I have adequate stock held. My worms are very hardy and as long as they don't freeze they should be fine. I don't know, might have to give that some more thought, but especially if they are being shipped to milder weather there shouldn't be a problem. 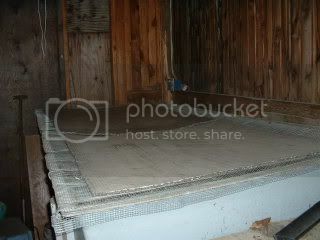 The biggest problem I have if I don't have holding stock is that my beds are not workable once the weather turns cold. Especially this year since I have decided to turn the heat off in the bins. The material will actually freeze up around the edges and on the top. But if I have enough composting going on in the bin the worms will be fine. As a matter of fact, last year the bin that had no heat (in fact it has been two winters without heat) had the biggest, fattest, happiest worms of all the bins. Go figure. Maybe it's because the bins that had the heat had more active worms but they weren't getting the food and attention they needed because it was so blasted cold for the farmer. And that's reality. So might as well turn off the heat. Tomorrow I'll probably try to turn another bin. This cycle around I'm not taking the material off the top but I'm turning it right into the bin and adding some fresh leaves to the top. Bins are running about 42 degrees F.
Another day of rain. Mild temperatures are still at 45 degrees at 11:00 p.m.
Fall is my favorite time of year. To step outside of the heated house into the freshness of the cool fall air. Especially when it has been raining. The air smells all earthy and you can see your breath. And the renewed leaf pile is always a welcome site. The worms have liked it to. I had to work today so wasn't able to get out there until tonight. All of the worm chow was eaten. Even the bin I had turned two days ago has worms up in it. The corners and sides that are not exposed to the light, (I keep a light on the bins at all times)are covered in worms. I have a migration theory. 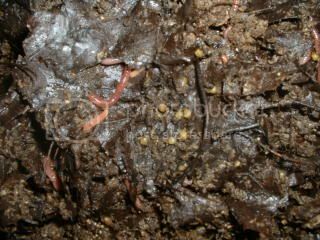 The worms like to crawl when the weather is favorable and especially if there if no ready food. Now I did say that they have food waste and bedding, but those are not as readily available as the chow. Anyway, I fed all the bins and put down 1 gallon of water on each. I have an order of worms going out, so Friday or Saturday I will gather and weigh the worms and set them up for fattening for a few days. I have a fattening recipe for the worms I will share with you another time soon. This is a sampling of what I use for my carbon material on my bins. 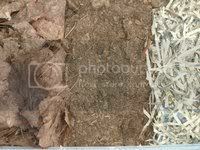 Large or small, I layer shredded newspaper, leaves and manure with my food waste to create a homey environment for my worms. They love it. In the winter I mix it up more. In the summer not so much. The more you mix it up the more heat you produce. Good in the winter, not so good in the summer. Today was a rainy day with the temps in the 40's. The worms like it when it rains. They seem to sense that it's safe to come out and they were all out chowin' down big time. Had to go out early and spread some chow and water lightly. When the worms are real active sometimes I have to feed twice a day. Better to feed more often than to put down too much for them to eat in a day. As the weather gets colder, and these inbetween days, sometimes it's difficult to predict what the worms will eat in a day. It's good to have the mild autumn days to work the bins before the freezing weather moves in. The worms don't come out much when it's cold and quite frankly neither do I. The Worm Factory worm have moved right on up into that layer of leaves I have put down. The older the bedding material they've been in is the quicker they are to move into the fresh. So here is one of my bins, for those who don't know. I have four of these 4X8 foot fiberglas bins. I have them covered with hardware cloth to keep out mice. One spring I broke my ankle and I wasn't able to get out to work on the worms(I did try it and almost regretted the effort). The mice moved in and built nests to raise their young. It was awful to try and get rid of them. I discovered that the worms really liked the air circulation they got from the insulation being up on the hardware cloth instead of being right down on the bedding. Today was another nice day. The sun was again shining with the air being a touch cool, reminding me of the time of year it is. The night was comfortable as I carried my watering can out to check on the worms. The worm in the bed I turned last night aren't up yet. It usually takes a couple of days for them to settle in after being turned, topsy-turvy. But the other three bins had worms up chowin' down on the worm chow. Still, the air is cool enough and the bin temps only being 40 degrees, the chow was only slightly eaten in two of the bins. Only one bin needed any additional worm chow, and each bin got watered down. I used one 2 gallon watering can for the job so each bin got 1/2 gallon water. My aim is to keep the top layer moist where the worm chow is so the worms will continue to eat. 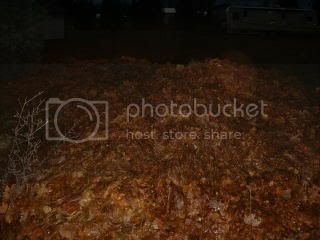 They also have a layer of food waste that is rotting under the top layer, plus the shredded newspaper and leaves that have been turned into the bedding when I turn the bin. There is plenty to eat at all levels of the bin. I brought in a bucket of leaves for my Worm Factory and the small bin I am holding harvested worms in. I put down a thin layer of leaves, breaking the leaves up well and watering to encourage the worms to move in. We'll check it out tomorrow and see how they like it. I have been fairly regular in taking care of the worm bins since the beginning of September and I am really amazed at how well the worms have come back. In September I literally could not see worms present other than a few skinny straglers. Now look! This is what the population looks like now as I turn the bins. 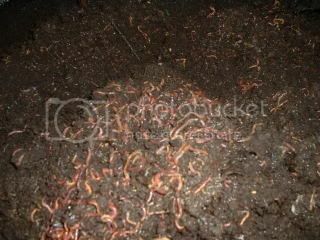 The weather has been freezing and the bin these worms are in is the bin that has been without the any supplemental heat for two winters. The weather last night was clear with a star filled sky. Today the sky has been blue with lots of sunshine. Yesterday the wind blew and I didn't want to get out and work the worms. But today was perfect. I took the top material off and turned the one Bin (Bin #4). My neighbor collects his food waste for me and in a weeks time he has collected about 1/3 of a 5 gallon bucket. I put this waste down the middle of the bed and cover with the material I took off. Then I put a 5 gallon bucket of leaves down. These leaves are from a pile I have been collecting for a number of years. These leaves were from the top of the pile and are there from last year. Some of the leaves are dry and some of them are wet. I see an occational worm in the leaves. I water the bin with a two gallon watering can. I put about one gallon of water on the bin. I feed the other three bins worm chow and add about one gallon water to each bin.